This term, all my student volunteers have processed many of the boxes of records we have on the Morley family and business of Saginaw, Mich. 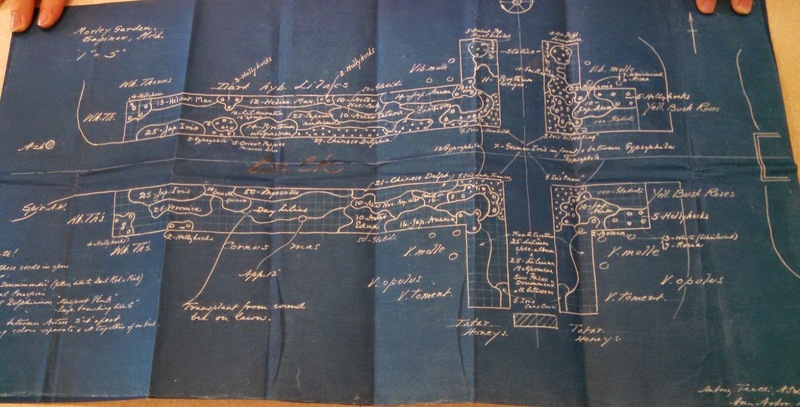 In one box, my student Gwyn Richard, found correspondence, a blueprint, and some copies of sketches, all dated from March to November 1915, between Paul F. H. Morley and landscape designer Aubrey Tealdi of Ann Arbor. The undated blueprint, entitled "Morley garden, Saginaw," includes a wide variety of flowers in four L-shaped flower beds, with notes about seeding and flowers. 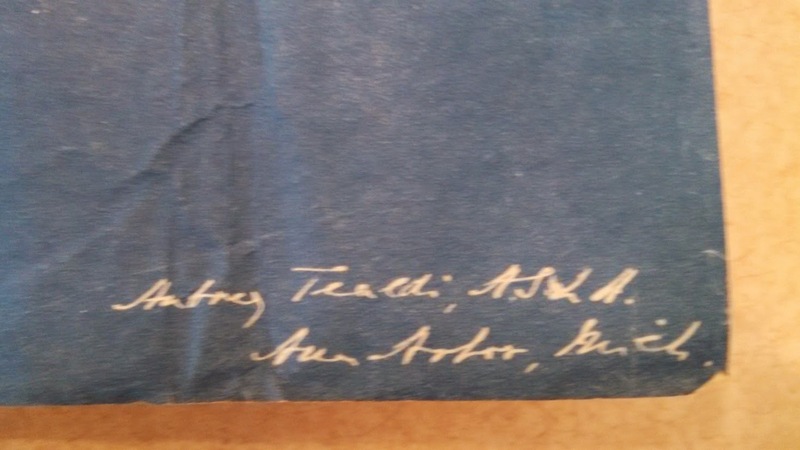 It is signed by Aubrey Tealdi, Ann Arbor. This was for Paul's home at 1330 S. Jefferson Ave., Saginaw, a home which no longer exists. In their correspondence, Morley asked about when to start the beds, expressed his unhappiness with certain plants and happiness with others, and requested Tealdi's rates and when they could meet. Tealdi responded in detail about plants, which were suited for what and why, the care of plants, and that his rate, normally $50/hour plus other costs, was reduced to a flat fee of $75 for Morley's two spring visits. 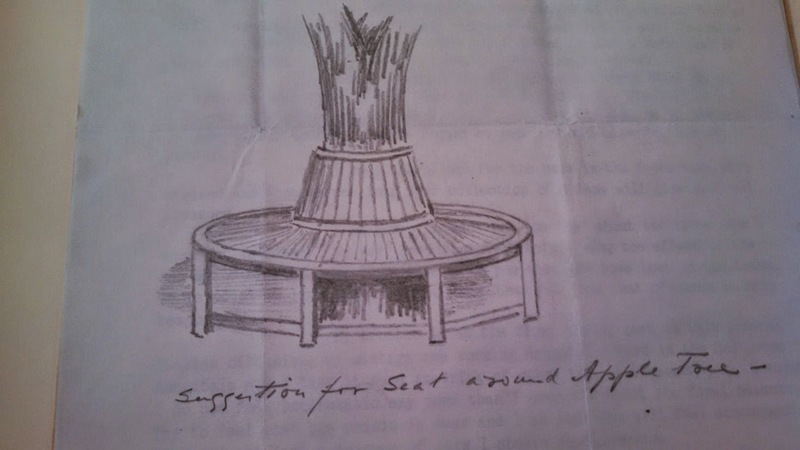 Ideas discussed between the men included the possibility of a children’s garden, an arbor, a seat ringing an apple tree, plans for gardens at Paul's lodge on the north branch of the AuSable River, the removal of a tree, Paul’s dislike of sunflowers, and his desire to keep up with his neighbors' landscaping projects. Both men also wrote briefly of their worries about the War (World War I). Morley noted the Italians were losing. This must have been a particularly painful fact for the Italian, Tealdi, who responded that he had male relatives fighting and female relatives active in the Red Cross. 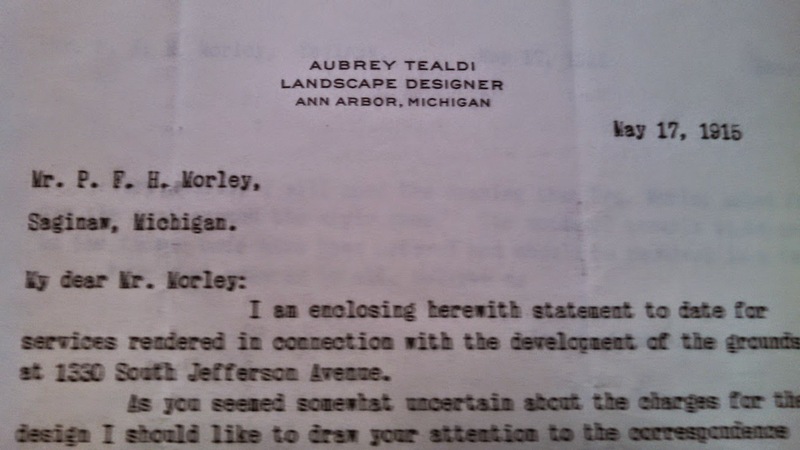 Tealdi's letter noting Morley's home at 1330 S. Jefferson Ave.
Tealdi was a significant landscape architect and professor who had an impressive career at and impact upon the University of Michigan (UM). The UM was the first institution in the Midwest with a department of landscape design, which was established in 1909 as a professional five year course. Tealdi was one of the first three instructors in the program. He graduated from the Royal Technical Institute Livorno in 1900. He became a Junior Professor at the UM in 1913 and Associate Professor of Landscape Design in 1915. In 1916, Tealdi was named as the Director of the Arboretum and supervised a great deal of planting of various species there. He held various positions until he retired in 1934 with the impressive double title of Head of the Department of Landscape Design and Director of the Nichols Arboretum. Tealdi is credited thusly “The department developed notably under Tealdi and owes much to his ideas and his personality. The excellent character and quality of the Arboretum are also distinctly the result of his work and interest.” Tealdi retired to his native Italy. (The University of Michigan, an Encyclopedic Survey, edited by Wilfred B. Shaw, Part VII, the College of Architecture and Design, pp. 1313-1315, internet available online via this link). Paul F. H. Morley was the son of Edward W. and Helen Morley. Edward and his brother, George W. Morley came from Ohio to Saginaw where they established a hardware store prior to 1882. It became second only to Sears. By 1909, it also became the second largest manufacturer of portable houses in the U.S. The Morley business saved the city of Saginaw from bankruptcy in 1933 by meeting its payroll. The company had various and numerous related business interests. It still exists today as a business travel, planning, and events company. For more information see http://www.morleynet.com. Paul (1884-1931) was born in Saginaw, where he attended local schools as well as a finishing school in the east. During World War I, Paul served as a captain in the Red Cross and headed a Base Hospital in Beaune, France. He was involved with many Saginaw businesses. In 1907, he married Helen Wells with whom he had five children. Paul died suddenly while at his lodge on the Au Sable River. He was survived by his children and four siblings. Many of the Morleys are buried in Ohio. The Clarke has two Morley manuscript collections. The first is a mixed collection of both business and personal records, Papers, 1833-2009. The collection continues to be processed in sections over time by various students. 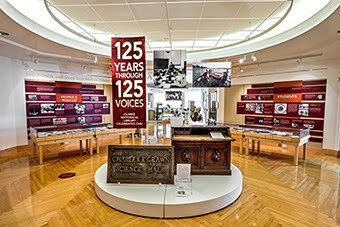 The catalog record and finding aids for the processed part of the Morley collection may be viewed by clicking on the link to Papers, 1833-2009. A number of Morley catalogs have also been separately cataloged. Michelle Ann Abate Presents on "Lil Tomboy"